Not all children with delayed speech are “little Einsteins” or garden variety “late bloomers.” Some have a speech-language disorder that will persist unless warning signs are recognized and intervention comes early. Includes a Guide for Parents Written By Lisa Geng. What advice do you give this mother? Joey seems to be developing normally in every other way—he’s had a few ear infections before this one, all of which resolved without a prolonged period of effusion. But his delay in talking does warrant further assessment, and you decide to send him for a hearing test after his infection clears. Meanwhile, you tell the mother not to worry—boys often speak later than girls, and there seems to be a history of late talkers in this family. You let her know that if results of the hearing test are normal, you will follow up at the 2-year well visit. Along with the newsworthy rise in the number of children in whom autism has been diagnosed are reports of an approximate 30-fold increase in the number of children with speech or language impairments since 1989, according to a 2001 US Department of Education (DOE) report.1 Those statistics show 7,801 cases of speech or language impairment among children born in 1983 (who turned 6 in 1989). Among children born in 1994, that number jumped to 211,984.1 This rise does not appear to be attributable to increased awareness alone, as there has been no comparable rise in other developmental disabilities (e.g., autism, four-fold increase; mental retardation, two-fold increase). The etiology of speech and language impairments is not completely clear, but a multifactorial etiology has been entertained (environmental factors; genetics; prematurity, i.e., increased number of low birth weight infants). Although most late talkers do, eventually, catch up and speak normally, it’s important to be aware of warning signs that may indicate a communication disorder rather than a benign delay. In such cases, as with all communication impairments, early diagnosis and treatment are critical. And, even in cases of a child who is merely a “late bloomer,” there are steps that can be taken to promote the development of speech. You are certainly familiar with the unfolding of developmental milestones (Table 1,) and the variability that may be seen in a typically developing young child. That variability can make it difficult to tell if a patient has an innocent delay or something more serious (Table 2,). So, how can you tell if your young patient is just a late bloomer or has a speech or language disorder? And why not let nature run its course rather than have the child and family undergo an evaluation and possible interventions? Family history, such as a strong heritability factor. There’s a higher risk of continued delay if one of a toddler’s parents or siblings had long-term language and learning difficulties. Communication: Is it delayed—or disordered? Otitis media with effusion causing a fluctuating hearing loss during the period of speech development. Low socioeconomic status and educational level. These families are more likely to have a child with a poor outcome. Parental characteristics that may inhibit speech, including the way parents interact with the child. Parents need to follow a child’s lead and provide a language model using simplified speech. Use of “parentese,” the way that many parents instinctively talk to infants in a high-pitched, sing-song voice, actually fosters language development by attracting the infant’s attention and resembling the pitch of the sounds he makes. Missed language explosion. Most children experience a vocabulary spurt around the age of 18 months, but late talkers don’t. Some late talkers have an “explosion” of speech later—between 24 and 30 months. If a child has not had a vocabulary spurt by 30 months, he is at considerable risk of continued language delay. A primer on language and speech disorders Language disorders involve either receptive or expressive ability, or a combination of both. Receptive ability is the understanding of the spoken word—retrieving and processing sounds in the language storage centers of the brain and discriminating the differences between sounds in words, like cat versus pat. Expressive ability is how we learn to formulate grammatically and syntactically correct sentences. The cause of SLI is unknown, but it appears to run in families. If a child has SLI, there is a 25% chance that another family member will be affected. 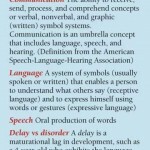 Speech disorders include disorders of articulation and phonology (dysarthria, apraxia, and phonologic disorder). Articulation refers to individual speech sounds and how they are pronounced. All children, not just those with a speech disorder, misarticulate sounds in the course of normal speech development. They may use sound substitutions such as “wady” for “lady”; omit sounds, saying “baw” instead of “ball”; or distort sounds, so that “snake” comes out “snek,” or “silly” comes out “shhilly.” Concern arises when these errors continue beyond the time a child normally outgrows them. Children with a phonologic disorder make sound substitutions consistently but, when given auditory and visual cues, are able to imitate correct sounds or words. Usually, they have normal oral muscle tone. The dysarthrias are a group of motor speech disorders that result from nervous system injury. There is a lack of strength and control of the muscles used for both speech and non-speech functions, such as smiling and chewing. Many children with cerebral palsy have a dysarthric speech pattern, slurring words, distorting vowels, and often producing slow, labored, nasal speech. Many have an oral motor weakness, which probably first came to light as a feeding problem, accompanied by a protruding tongue, open mouth, or drooling. Dysarthria can also accompany other neurologic disorders, such as muscular dystrophy, myopathies, facial palsy, or closed head injury. Children with dysarthria have difficulty in the actual production of speech sounds. In particular, they are more likely to distort consonant sounds. This differs from apraxia, in which consonants are omitted. Verbal apraxia is a neurologic motor speech impairment that affects the planning, executing, and sequencing of speech movements; that is, a breakdown in the neural transmission of messages to the muscles of the jaw, cheeks, lips, tongue, and palate. There is no obvious weakness in these muscles. To make themselves understood, these children may point, grunt, and become increasingly angry at their inability to communicate. Sometimes the same word can come out four different ways. The more these children try to talk, the more stymied they become and the harder they are to understand. They may drop the final consonant in single syllable words: “Cat come home” becomes “Ca co hoe.” They may transpose sounds within a word. Instead of saying “elephant,” they may say “efelant.” One day, an apraxic child says a difficult word perfectly—and then he loses it for weeks. He may also make unusual movements of his jaw, lips, and tongue, as if groping to find words. It’s obvious that he understands most of what is said to him, but he cannot respond properly. There is often a history of limited babbling and vocal play. The child may have an elaborate gestural communication system. What should take place during an office visit? Children should receive the benefit of developmental surveillance and screening at each well visit. The American Academy of Pediatrics (AAP) has written policy statements emphasizing the need for developmental surveillance and screening from birth to 5 years old.9,10 The American Academy of Neurology (AAN) and Child Neurology Society (CNS), in a joint practice parameter on the screening and diagnosis of autism, also address early identification of language delays, as it is one of the early signs of a possible autistic spectrum disorder.11 These expert groups agree that parental concerns are usually well-founded and that pediatric practitioners should pay attention to them. At every well visit, you should ask probing questions to determine whether your young patient has age-appropriate developmental skills (part of the process of developmental surveillance).12 Ideally, observe and assess the child’s developmental capabilities for yourself. This may seem like an almost impossible charge for a busy practitioner; parent questionnaires can help in this regard. Filled out beforehand at home or in the waiting room, they can be a valuable adjunct to your experience and clinical judgment and make the process more objective. Another screening tool in parent questionnaire form, the Parents’ Evaluations of Developmental Status (PEDS), focuses specifically on the parents’ appraisal of areas of development.14 There is also the Denver II, which requires administration by the practitioner and can take about 20 minutes to administer—longer than most office visits. Whereas the ASQ and PEDS are parent-reporting screening instruments that can be used for general developmental screening, the Checklist for Autism in Toddlers (CHAT) can be used to screen specifically for autism from 18 to 36 months of age.15 There are nine yes-no questions answered by the parent and five brief interactions between the child and the practitioner. It takes only five to 10 minutes to administer and score, and it can be downloaded from the Web without charge ( http://www.nas.org.uk ; search for “CHAT”). Any child with a delay in language or social development should have a formal hearing evaluation by an audiologist, even if he had a hearing screening at birth. This is especially critical in the child who has a history of otitis media with effusion, in which case referral to a pediatric otolaryngologist may also be warranted. If the child is an infant or toddler, you should simultaneously refer him, with parental consent, to the local early intervention (EI) program, where he will receive a multidisciplinary evaluation to determine his eligibility for habilitative services. If he’s older than 3, refer him to the local school district for a developmental evaluation to see if he qualifies for special services. There are also many activities parents can do at home with their child to promote the development of speech. These are detailed in the Guide for Parents -This guide was written by Lisa Geng. Ms. Geng is co-author of The Late Talker What to Do If Your Child Isn’t Talking Yet. The Individuals with Disabilities Education Act (IDEA)16 requires that EI services be provided for children from birth through age 3. Any child suspected of having a delay in any aspect of his development is entitled to an evaluation to see if he is entitled to interventional services. To be eligible, children must either have a diagnosed condition with a high probability of developmental delay (such as Down syndrome or meningomyelocele) or an established delay in physical, cognitive, communication, social-emotional, or adaptive (self-help) development. For the purposes of EI, a developmental delay is documented as a 33% delay in one area of development or a 25% delay in each of two areas. For example, a 24-month-old would qualify for services if he is functioning at the 16-month level in communication ability or at an 18-month level in both communication and physical (motor) areas. Regrettably, many children with speech and language disorders are not afforded the opportunity to benefit from EI because they are not referred into the program before their third birthday. To avoid this, it is advisable to discuss this program with the family of a child who has signs of a communication delay, even if you believe that the child might “outgrow” his delay. Parents may also choose to self-refer. If your office does not have the contact information for referral to EI, your state’s EI official designee can be located through the National Early Childhood Technical Assistance Center (NECTAC), http://www.nectac.org/, or the local department of health. Communication problems can also be damaging to a child’s social life. “Even if a delay is transitory,” states a report from New York State’s Early Intervention program, “a communication delay at a young age may have an impact on the child’s ability to form relationships with peers and adults and, therefore, may impact the child’s overall development.”19 Because many children with a speech disorder do not know the rules of conversation and social interaction, their behavior can become inappropriate (hitting another child, for instance, to let him know he wants to play) and harm their chances of making and maintaining friends. Social failure atop academic failure can lower self-esteem. Rice and colleagues found that children with communication impairments were frequently ignored by other kids and were not as popular as so-called typically developing classmates. This bias was commonly shared by adults, including teachers and speech-language pathologists. Rice also found that adults consistently rate children with communication impairments as less intelligent and less socially competent than their peers. Erring on the side of caution Your primary care role in early identification of children with a developmental delay has been underscored in policy statements from the Committee on Children with Disabilities of the AAP several times over. You are asked to provide a medical home for children and families who may have a developmental delay or a special health-care need, and you are in a position to be the “first point of contact when parents have concerns about their child’s development or behavior.”25 When these concerns are ignored or dismissed, parents often become frustrated and angry, especially if the child is diagnosed with an autistic spectrum disorder, apraxia, or language impairment a year or more after symptoms were recognized. The notion that all late talkers are “little Einsteins” is a myth; not all these children have a positive outcome with a wait-and-see approach. Reviewing the “Predictors of continued language delay” should help guide you in deciding whom to refer for further evaluation. If you are unsure whether a child is presenting with just a delay, don’t gamble! Refer the family to a developmental specialist for an expert’s opinion. Marilyn C. Agin, MD is on the medical staff of the department of pediatrics, section of developmental pediatrics, St. Vincent’s Hospital and Medical Center, New York, N.Y. She is medical director of New York City Early Intervention Program and is in private practice in NYC. She is co-author of The Late Talker — What to Do If Your Child Isn’t Talking Yet (St. Martin’s Press, 2003). Dr. Agin has nothing to disclose in regard to affiliations with, or financial interests in, any organization that may have an interest in any part of this article. 3. New York State Department of Health Early Intervention Program data, 7/98-7/99, (internal records) Albany, N.Y.